In recent weeks residents in the Kingswood and Fishpond areas of Bristol have been targeted by thieves breaking into homes in order to acquire car keys before driving off with the vehicle parked on the drive. Police are warning residents across Bristol of the consequences when leaving valuables in plain sight as it is suggested that those burgled had left items in easy reach of unsecured doors and windows. There were even 3 incidents where thieves attained car keys through cat flaps. Fortunately 15 of the 18 stolen vehicles have been recovered and returned to their owners, but this recent spate of burglaries calls for more security measures in place at home. In the run up to Christmas many homes are easy targets. So rather than facing disruption to your home this Winter make sure your keys, as well as other small valuables such as phones are secured away and out of sight. Why not take a look at these new Phoenix Compact Home or Office safes? 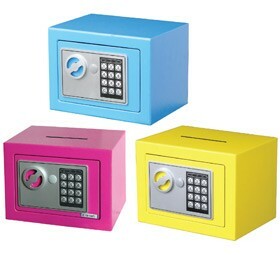 Available in three bright colours rather than the usual grey of traditional safes, they offer a simple user friendly digital lock with a key override facility. Programmable with an easy to remember personal code, the safe has a built in tamper lockout system which freezes the lock once an incorrect combination has been entered 3 times consecutively. The Phoenix safe is built with a 3mm steel plate and 1mm body with concealed internal hinges for added security. Ideal for offices deposit models are also available with an 80mm x 3mm slot for coins, bank notes and paper slips. This entry was posted in Safe & Vault Product Reviews, Security Industry News on December 2, 2014 by Phil Hill.